Description: Click on this backpack for a clue to rare items! /join Grenwog for a HARD challenge fight! 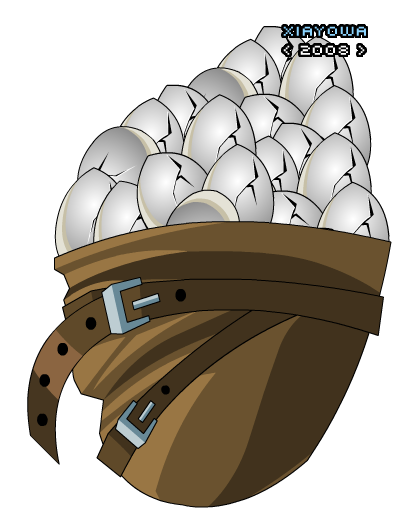 Click on any Vorpal Bunny pet to get egg quests! General Porkon has a rubber ducky! Maybe he drops a Quacked Egg? Help others by do the quests by keeping your Vorpal Bunny equipped! It is said that a certain Werewolf has a 1% chance to drop a Were-Egg! The Berzerker Bunny Helm transforms if you click it! The Berzerker Bunny Spear transforms if you click it! There is a Werewolf in Willow Creek… if you do all the quests. The Treant at the farm has a 3% chance to drop a Wooden Egg! Vorpal Bunnies are so cute… try petting one! There is a wereboar in Greenguard West. Hoof it on over there. Thanks to Ashley_1, Death on Toast, Kaelthass, mutantsrus and Xia.